located at the Baden United Methodist Church. Friday, April 5th and Wednesday, April 10th. Collection will take place Saturday, April 13th. Please begin picking up bags from your area starting at 9:00 AM. During World War I, Boy Scouts planted vegetable gardens to provide food for the hungry. President Roosevelt called on Scouts to collect food for the needy during the Great Depression. PlantingVictoryGardens were the Scouting “good turns” organized during World War II. Today, Boy Scouts continue their community service by helping the hungry in southwestern Pennsylvania. The national initiative “Good Turn for America” encourages companies, community organizations, and Scouts to be involved in local community-service that fights hunger through their participation in Laurel Highlands Council’s Annual Scouting for Food drive. Since 1987, over 108 million units of food have been collected and distributed to Allegheny, Beaver, Greene, Washington and Westmoreland county food banks. However, the need to help the hungry continues to grow. In 2012 the campaign will be expanded to include Bedford, Blair, Cambria, Indiana, and Somerset counties. 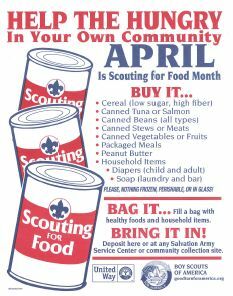 Scouting for Food is targeted primarily at collecting canned foods, particularly canned products having a high nutritional value. In addition to food; paper products, soap, and bulk packages of household commodities are needed. Emphasis is placed on certain recommended products. The recommended list is shown below. All kinds of canned fruits, vegetables, and canned products are welcome, as well as sealed, dry packaged foods such as cereals . In general, the drive is not prepared to accept perishable items such as produce, milk, ice cream, frozen food, and other perishable products. The drive is prohibited from accepting any home canned or packaged food, baby foods in glass jars and any food having the package seal broken. If large quantities of perishable products become available, please contact the Scouting for Food office at the Laurel Highlands Council at (412) 325-7941 for instructions. For the purpose of measuring the results of the campaign, each item of food or product collected will be assigned a unit value. To encourage the giving of food most needed for nutrition, certain items will be awarded higher unit values. An attached scorecard and general information pamphlet is available for use in reporting the results of individual campaigns . Although the contribution of food and household products is preferred, cash contributions are also appreciated and will be used to support the Scouting for Food campaign and expenses. Please make checks payable to Scouting for Food. An acknowledgement letter will be sent for all donations.